Ms. Murphy feels honored to witness to all of the wonderful changes and growth that happen in kindergarten and to support young students as their independence and curiosity unfold. She loves the social-emotional learning that takes place at this age and guiding students as they learn to problem-solve and be kind, respectful friends. Ms. Murphy believes there are no hearts bigger than those of kindergartners! She is grateful for Burley's welcoming environment and the open-minded, caring, and fun staff. With her colleagues, she enjoys reading professional texts to keep up on new ways to instruct, support, and engage students. 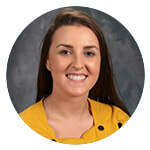 Ms. Murphy is currently pursuing her Master of Arts in Curriculum and Instruction with an ESL Endorsement. In her free time, she loves to read, discover new restaurants, visit with friends, travel, and spend time with her family. She is one of three girls, has two nieces and one nephew, and a puppy named Fionn. Ms. Murphy is originally from Ireland, lived in Florida for a year, and then moved to Chicago.